Hunting scents and attractants are getting famous nowadays. Their actual job is to fool the smelling sense of animals. Best deer attractant can easily help you lure your target even if the animal is staying far from you. To gain success in hunting deer, you can also buy one for yourself. But before buying you must know what features do best hunting scent produce. Though there are varieties in hunting scents, their objectives are common. Today, we have picked ten deer hunting scent or attractants after checking whether they have those primary features that can make them best. First of all, we checked if the product is capable of covering up the normal odor of your body and equipments. Secondly, we checked whether the fragrance makes the deer finds itself comfortable around the odor or behaves ferociously. Finally, we checked the strength of the product. Because only a strong scent can lure a deer back to you. After all these we chose ten and here are those. We are showing you now one of the most strong and effective scent attractants set in the current market. The manufacturer of the product is Conquest Scents. This set contains two different types of scents. One is for drawing bucks. This scent is effective in rut seasons. You can even use it in before and after rut season times too. The other scent from the set is also effective too. It helps to smell your hunting area like bedding area of a deer. 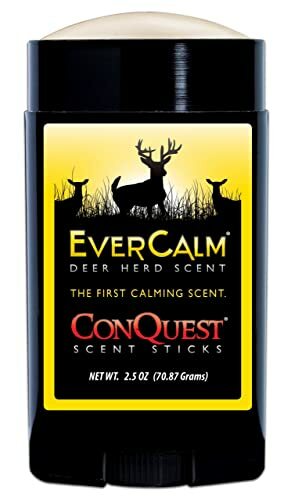 This scent is eligible for calming your target or deer precisely. 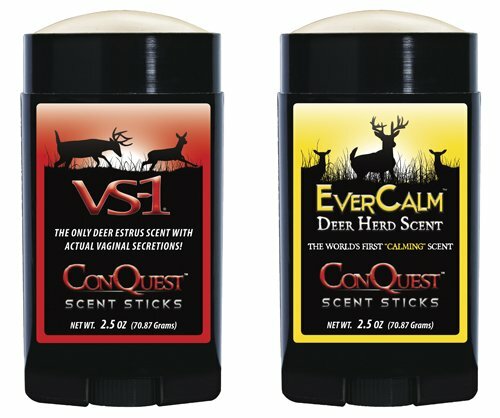 A hunter can surely depend on this oldest calming scent on the market. For user’s satisfaction, the manufacturer has used a wax stick formula. Because of this, a hunter can easily use these scents whenever they need while they are in a jungle. No preservatives are added so that you cannot get any negative side of the set. These scents will not spill so easily. You can carry them comfortably inside your backpack. Contains two type of scents; VS-1 and EverCalm. VS-1 can be effective in pre-rut, rut and post-rut seasons. EverCalm can help you calm even a mature deer. Wax stick formula help you use them quite easily. No leakage issue can be found. The VS-1 puts effect slower than EverCalm. The scent killer that is going to be shown now lasts longer than other similar products. With the help of Hunt Dry technology, it will be dried faster after being applied. So, you can apply it even when you are in the jungle. This spray actually covers normal human odor. It works quite exceptionally. It doesn’t matter if you are sweating a lot. This spray will not allow your body scent to spread. After spraying once, you will be able to see its effectiveness for a quite long time. It not only masks the normal odor but also prevents new odor to form. 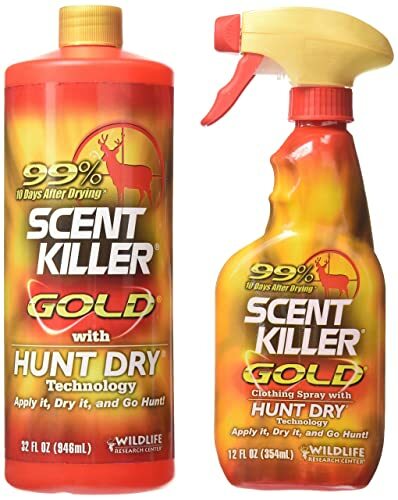 As the Hunt Dry technology is used here, you spray this on your clothes even a week before going for hunting. Another fascinating part of this spray is it can perform its best in types of season. Even the wind flow will be unable to put any effect on the performance. Capable of performing in both dry and wet conditions. Hunt Dry technology is integrated for users’ satisfaction. The formula lasts longer to fight with your normal body odor. Even helps to stop new odors from forming. Eligible for any kind of weather. There are few chemicals used to make the formula which can cause a little bit of problem to a few users. So, judge those chemicals before buying. The main advantage of this scent is the material. Pure natural ingredients are used to make this scent. Pure natural doe estrous from the whitetail does from the estrous cycle are used to make the scent. That is why it can lure a buck quite easily. You will get the perfect result using this product in both pre-rut and rut seasons. You have to soak the drags of scent to get maximum effect. We already told you that no harmful chemicals are used to make this scent. So, you can use this scent without having any tension of getting a disease. Though the manufacturer has made this to lure bucks, it can sometimes lure other animals too. You can store this scent for more than a year. You don’t need to freeze the scent to keep it good. Just keep this scent in room temperature and it will be capable of performing its best all the time. The user can use the scent easily wherever they want. Capable of attracting a maximum number of bucks even after a long period of time. Capable of luring other animals too in many regions along with bucks. Capable of putting an effect in a short period of time. Can lure bucks even from a longer distance. Users should not touch the scent in bare hands. It has some dangerous chemicals. We are now presenting you world’s oldest calming formula that can truly help you hunt down your prey with ease. 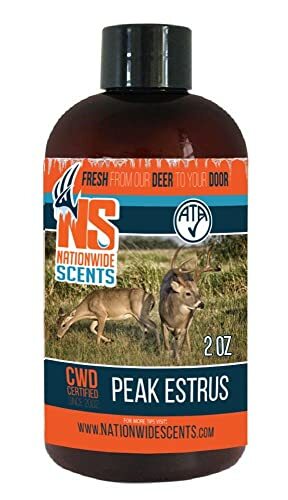 It will be a perfect decision if you buy this scent for deer hunting. The stick can perform pretty well in any kinds of situation. It can be used pretty easily. Till now, no one has found any leakage issue about this stick. It won’t spill that easily and create a mess. The product is actually a collection of odors from the whitetail deer’s bedding areas. The deer will feel comfortable and safe in the area where you have put on the scent. This is the reason why a deer will calm down and behave polity after smelling this scent. Because of this, you can shoot the animal easily. The scent not just calms the deer but also attracts other animals near you. This scent is perfect for use in most of the seasons. Eligible for use in any type of weather. The scent does both jobs of calming and attracting. The deer will surely come near you without hesitating. Deer’s bedding areas’ odors are used to make the scent. Can cover the human odors in any conditions. It can sometimes attract other animals such as fox and bears. The scent won’t last more than a couple of days when heavy rain will be falling. This Scent Killer’s spray helps you to control other odors to spread around. By this, it doesn’t allow the animals to detect you easily. Bucks will not notice you and they can come near you without any hesitation. The main attraction of this spray is the Hunt Dry technology. Spraying the formula on your clothes or under your boots will not make them wet. The formula dries very quickly. So, you don’t have to go on hunting wearing dry clothes or outfits. The scent lasts much longer than other similar scent products. You can use this spray on your outerwear even weeks before going on hunting. The manufacturer assures the spray is capable of performing for a long period of time. It can mask any kind of odor. This spray has no side effects. That is why consistent using won’t cause any kinds of trouble at all. Has one of the best formulas that can control natural body odor for a longer period of time. Animals won’t be able to smell you even you stay really close to them. The spray has no side effect that can cause you even a minor disease. Performs well in any kind of weather. Outfit won’t become wet by spraying the formula on the outfit. When the wind flows really fast, bucks might be able to smell you if you are really close. This is one of the finest scent attractants on the market. It works pretty quickly. Bucks from a very far distance also can smell the scent and come near your stand or blind. The main reason behind the performance is the material. Quality materials are used to make the formula of the scent. You can use this scent anywhere you want to attract bucks. You can use it on your boots, blind, stand and decoys. The most useful feature of this scent is you can store this scent for many years. This scent attractant works perfectly in both pre-rut and rut seasons. The aroma of this attractant spreads quickly in nearby places. Not only bucks but also other animals like foxes or dogs will come near you in search for the source of the scent. Another useful feature of this scent is it just lures animals. But it doesn’t put an effect on the behavior of animals. 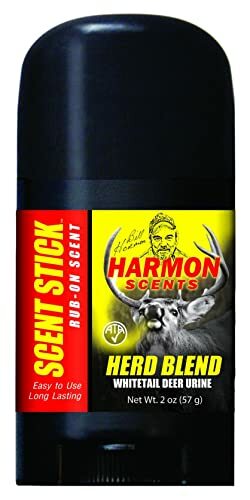 Deer or buck will not behave unusually after smelling this attractant. Capable of drawing bucks and other animals near you in a short period of time. Pure natural doe estrous urine is used to make the formula of the scent. Performs best in pre-rug and rug days. The aroma spreads quickly and attracts many types of animals. A user can store this product for a long time. Very few animals might find this aroma irritating in their noses. They can be confused about whether to follow the scent or not. There is lots of difference between smell covering and attracting. Scent Killer’s this deodorant actually covers or kills the natural human odor. By this, it helps you to remain undetected. When you remain undetected, you can go near your prey to kill it. Most of the odor-covering products fail to perform in all types of weather. But this deodorant can help you in kinds of situation. This deodorant has no specific smell so that it can let you mix with the nature of jungle. Strong and powerful ingredients are used here. You can rely on this deodorant even when you are going to a place where the temperature is high. Few people sweat a lot even in normal temperature. If you also have the same problem you can buy this deodorant. It doesn’t allow sweat to spread any smell that can alert an animal. You will suffer from any skin issue if you use this regularly on your body. Stops your body odor to spread around and make you detected. Can be used easily on the body parts. 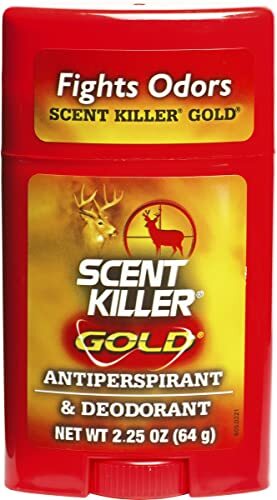 The deodorant lasts long enough to help you in hunting. Capable of performing its hundred percent even in the warmest weather. The manufacturer has used Aluminum to make this deodorant. Few people might have issues with this material. So, check before using. 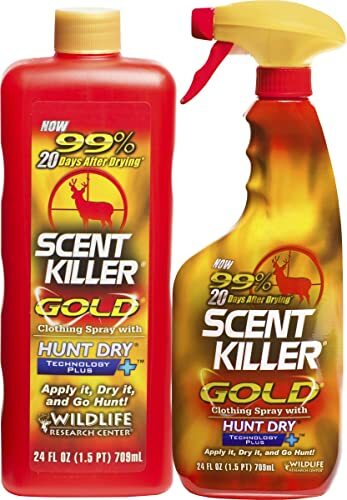 This is a kind of spray that is truly an obstacle to the smelling sense of deer or bucks. This spray is quite different from other similar products. It neither attracts an animal nor masks your human scent. It actually jams the sense of smell of animals so that they become unable to sense your presence. When an animal doesn’t able to know your presence near it, you can easily go near it. Because of this feature, you can shoot the animal from a shorter distance so that you shot can be accurate. Though the spray works in a different way than other, it still performs better. You can spray this formula on anything you are wearing or anything near you. You can even use this spray on your blind, tent, stand and other types of equipment so that you can be undetectable. 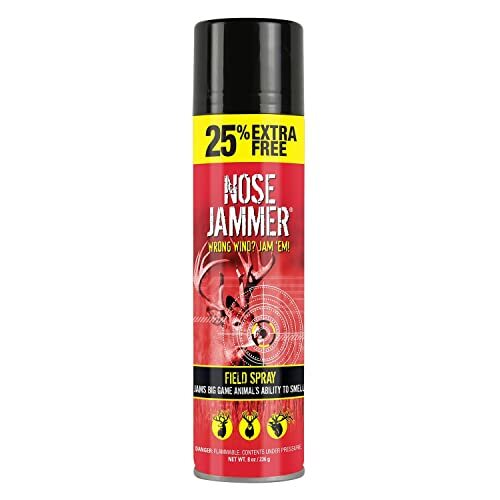 This spray can perform in any condition and any types of hunting. This spray can be used very easily. Works firmly by overloading or jamming the smelling sense of your prey. The formula or liquid has no side effects that can harm you. Eligible for any kinds of hunting. Works fine even in windy conditions too. Tree emitted compounds are used to make this spray. The scent smells like vanilla extract. Few users might find the odor awkward. This scent is made by Nationwide Scents. It has the capability to put effects very fast. Even expert hunters will also suggest you use doe. It will lure a buck to you faster than other products. 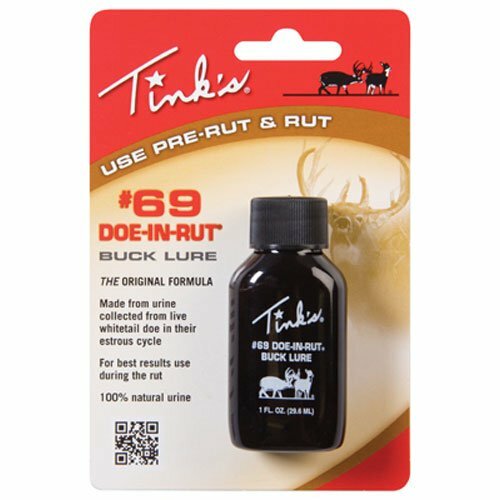 In this product, Estrus scent urine replicates a doe in heat. It is proven that this scent will be able to mask your human scents so that bucks don’t feel your presence. Even the strongest human odor will not be able to stand a chance against this scent. Bucks will surely behave normally after smelling this scent. This scent won’t cause you any serious disease. So, any people can use this in hunting. Purest deer urine will help you to lure the bucks so fast that you can hunt down a buck within a short period of time. As this scent is pretty much strong, it will spread quickly even in a long distance. Capable of luring a buck faster than other similar ones. Doesn’t give a chance to human scents to alert the animal. The doe urine maintains quality and performance. Powerful enough to lure a buck even from a longer distance. The scent won’t cause you any kind of disease. The scent smells strong. Few users might not feel comfortable near this scent. This scent is one of the finest scents in the market that can easily put effect positively on your hunting trip’s result. The scent has no side effects. You don’t have worry about anything while applying this on your body or clothes. This scent doesn’t transmit any harmful disease at all. The bucks near you won’t be able to feel your presence when you apply this scent. Animals won’t get ferocious or alerted by smelling this scent. You can apply this anywhere you want according to your comfort. After applying, you will be able to see its effects on bucks near you quickly. They will follow the scent and come near you without being alerted. The manufacturer also ensures the scent won’t spill and ruin your backpack or dress. It will not leak at all. This scent will stay fresh even after a couple of years of buying. Can be effective in many ways such as rubbing on boots, leaves of trees, and many more. The scent formula has gone through filed tests and fully succeeded. A combination of hard blended urines is given with the scent stick. The scent doesn’t transmit any kind of skin disease. The calming effect of the scent helps to calm down the bucks near you. There is no specific bad side of this scent. But the manufacturer didn’t describe anything strong about how long this scent will be able to attract bucks after rubbing once. As we told you earlier that the main job of best deer attractant is to become an obstacle to the strong sense of smell of a deer. The products we have shown to you can truly do that. But always remember one thing before buying. Read the instructions given on the bottle carefully. Sometimes scent might contain harmful chemicals that can cause trouble to your nose or skin. And always buy only those which can suit your type of hunting.